The Hyndai (ha-yun-day) Tournament of Champions will go down as one of the weirdest tournaments on the PGA Tour. With the tournament scheduled to start on Friday and a Monday finish, the good folks of Chicago should have been able to watch golf on their TV’s that would remind us of what summer should look like. Beautiful courses, sunny skies, everyone playing in short sleeves, and just out right enjoying the breath taking views of Hawaii. Instead we saw the PGA Tour play a quick game of Red light Green Light, and what looked like winds strong enough to carry Rickie Fowler into the Pacific Ocean (seriously at one point he tweeted for help on the 8th tee box). A few players got in roughly 8 holes on Friday prior to the officials calling for a stop in play, but no one was surprised. I was however surprised when the PGA Tour decided to restart the tournament because of unfair conditions. Agree or disagree, I understand the need to make the call seeing that most of the players had not even started their rounds yet. When someone has to make a call like that you will never be able to make every one happy, no matter which way you decide. Saturday was no different from Friday. Players started, players stop, and then tournament restarted. Sunday was no better, and the players didn’t even venture out onto the course. Finally the weather was cooperative for playing golf on Monday, and we fans get to see the PGA Tour go 36 on Monday with a Tuesday Finish. Kapalua’s Plantation Course is one of my favorite layouts that the PGA Tour plays. I am not sure if there is another PGA Tour Event played on a course with 5 par fives. Par fives are what I remember from a golf course. Not the par threes, and certainly not all those bogeys I make on the par 4’s…boring. 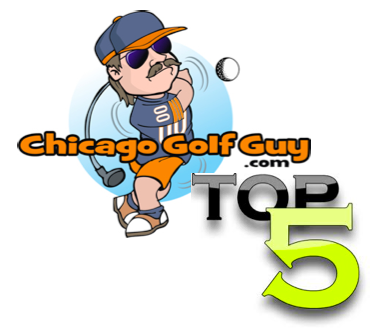 But a course that has a closing stretch of drivable par 4 14th, reachable par 5 15th, and par 5 on the last that is reachable in two – if you can hit it as far as DJ hits it – there is not much more that you can ask of for a fantastic finish to the PGA Tour’s TOC Event. Dustin Johnson hit the ball better than any other player this week. He hit an astounding 33 of 36 greens on Monday, which included quite a few hit under regulation. DJ’s putter was not as hot as it could have been, but who needs to make every putt when you hit that many greens, and can two putt for birdies – which he did. Hit it big, and occasionally make a putt, that is the way we all aspire to play golf. Dustin held a four shot lead going into the final round on Tuesday. Being that Dustin has been in the lead in some major events, and well not closed the deal, there were talks of Dustin’s ability to maintain a lead. The 2010 US Open stories start up, and then the 2010 PGA Championship, the 2011 British Open and everything in between that makes Dustin the player that he is…a world class player that can and will get the job done, but at a few major tournaments he had a few major slip ups. DJ definitely quieted the doubts for all of us when he just flat out dominated the Kapalua’s course, despite some wild drives, and putting woes. The Hyundai TOC is Dustins 7th PGA Tour Victory, and the first for the TaylorMade R1 driver (first of many I am sure). When Dustin hit a wayward drive on the 9th to cut his lead in half, and then hit it into the native grasses on the 13th, I thought oh boy he could be in trouble here. Then he finds the ball and hacks it out, only to have the ball go a few feet. About 15 minutes later he walks away with a double on 13 and a one shot lead over Steve Stricker. Enter the 14th hole where DJ pulls out the big dog, bangs it just short of the green 405 yards away, and then proceeds to chip it in for eagle. Its a cinderalla story folks, and thats all she wrote. With four holes left to play and the lead back up to three, and two of those four holes being par 5’s no one stood a chance to catch Dustin. It was a great finish to a very weird event. I for one hope the weather is a little more Hawaii like on Thursday when the Sony Open starts…oh wait thats tomorrow. Sweet! • Dustin Johnson followed a double bogey at the 13th hole with a key eagle on No. 14 which helped him to a four-stroke victory over Steve Stricker at the 2013 season-opening Hyundai Tournament of Champions, his seventh career PGA TOUR victory. • Johnson finished last in fairways hit for the week (23/45 – 51.1 percent) but 2nd in greens in regulation (88.9 percent). • Johnson has finished in the top 15 of the FedExCup in each of the last four years and inside the top 10 in each of the last three years on the PGA TOUR. Luke Donald is the only other player to finish inside the top 10 of the FedExCup standings in each of the last 3 years on TOUR. • Johnson was also the only player to card a top-10 finish in all four events of the 2012 FedExCup Playoffs and the first to do so since Padraig Harrington accomplished this feat back in 2009. 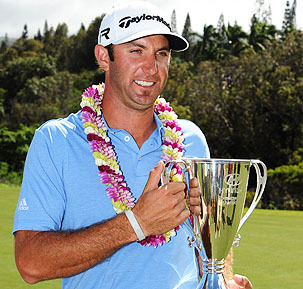 • Johnson leads players in their 20s with seven career PGA TOUR wins. Players under the age of 30 with three or more victories on the PGA TOUR: Dustin Johnson (7), Rory McIlroy (6), Anthony Kim (3), Webb Simpson (3), Keegan Bradley (3).